It’s now Day 5 of the 2014 Winter Olympics in Sochi, and Canada is in the Top 3 in the medal count. Whether you’ve watched the Canadians compete in speed skating, moguls or ski jump, it’s hard not to notice the incredible shape these athletes are in. With that in mind, here are three MaRS clients that can help you get your body Olympic-ready. 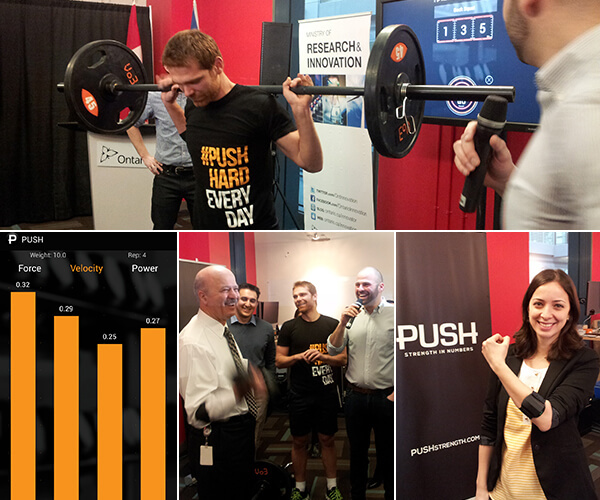 A graduate of MaRS’ JOLT accelerator, PUSH has developed a wearable fitness device to help you optimize your training by instantly providing feedback about your movements at the gym. Wearable technology is becoming a huge trend in sports and fitness, and many athletes in Sochi have used devices like this one to gain an edge in their training. Unlike other fitness trackers that estimate calories or count steps, however, PUSH measures your power, force and balance. That is, your strength. Mike Lovas, one of the co-founders, says strength is the foundational training of all serious athletes. “Metrics and analytics have been used for years in strength training, but have typically been reserved for top athletes and coaches. We are making these metrics and the knowledge base around them, available to anyone,” he says. 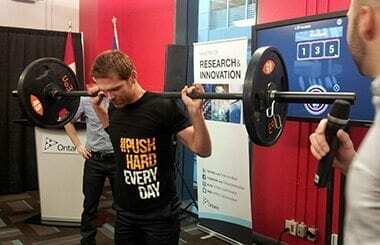 I tried out the device alongside PUSH’s co-founder Suresh Joshi and lead sport scientist Matt Kuzdub during an announcement of the first recipients of the new Youth Investment Accelerator Fund program—PUSH is one of them! While I’m not heading to Sochi anytime soon, the app is perfect for anyone interested in tracking their progress at the gym and making their workouts more efficient. The company’s video campaign even features an Olympian. Beach volleyball player Martin Reader competed for Canada in the London Olympics. Suresh hopes to get the device into the hands of more athletes soon. “As soon as possible, more pros, more Olympians. That would be fantastic,” he says, although any formal relationships will have to wait until the next games. The device is currently in beta testing (the company had over 1,000 applicants sign up in 24 hours!) and Lovas says the company aims to release the device this summer. There’s nothing like a team sport to get the heart pumping. MaRS client Aussie X delivers a sports program that teaches the power of sport and community through Australian-rules football (“footy”), netball and cricket. The company provides programs for camps, schools and corporate events. Not exactly sure what footy is? That’s half the fun! Founded in Toronto by two Australians, the programs are designed to motivate participants to enjoy the benefits of exercise at varying degrees of intensity. Trying a new sport can definitely add some needed variety to your gym routine. Learn more about Aussie X’s programs here. TinyHearts’ app, Quick Fit, offers a seven-minute workout to help you get in shape fast. Researchers have found that intense interval training with brief rest periods can be just as effective as a prolonged endurance workout. Quick Fit guides you through a series of exercises with video and voice prompts. The routine is built for busy people who are looking to squeeze in exercise with zero equipment needed. Think jumping jacks, pushups and crunches. You can also track your progress over time and add new workouts, like Quick Abs for abdominals. At only 99¢, the app is a lot less expensive than an unused gym membership! Not sure if you’re ready to download? You can try a free web version here.